TLV Euro Engineering has helped to identify faulty steam traps and reduce steam losses at Sunlight's commercial laundry facilities. As a commercial laundry with numerous facilities in the UK, Sunlight relies heavily on having a continuous supply of steam to maintain laundry services to its industrial, commercial, NHS and public-sector customers. With TLV Euro Engineering equipment specified at many of the company's sites, Sunlight had no hesitation in approaching the steam specialist when it needed a solution that would enable its own engineers to undertake steam trap surveys. 'If a steam trap stops, we don't notice immediately and it soon starts to cost the business a lot of money,' said Peter Woolstenholmes, Sunlight's energy manager. With several busy laundries, Sunlight can experience up to three steam trap issues per site per week, so the company needed to find a solution to a problem that could potentially cost more than GBP60,000 per year. 'We needed to check for faulty traps and steam losses more frequently to ensure that the steam system worked at maximum efficiency,' said Woolstenholmes. 'However, we [also] needed a solution that our engineers could understand and use easily, and the PT1 Pocket Trapman was an obvious choice because it quickly makes basic operational judgements, which helps our onsite engineers identify traps that require servicing, repair or replacement,' he added. TLV's PT1 Pocket Trapman uses the latest ultrasonic and temperature detection technology to simultaneously measure vibration and surface temperature and, within 10-15 seconds, displays operational judgements for traps and valves based on its findings. The results are displayed on an integrated digital screen and show one of five diagnoses for steam trap inspections (good, blocked, caution, lowtemp or leaking) and three for valve inspections (good, caution or leaking). In all cases the surface temperature of the trap or valve is also displayed. 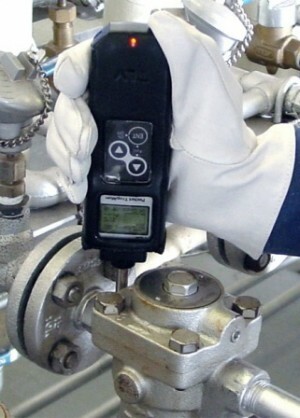 As well as diagnosing traps and valves, the PT1 Pocket Trapman can also be used to inspect bearings, displaying average and peak vibration acceleration levels, CF values and surface temperature, within 60 seconds. The PT1 provides eight hours of operational use powered by two AAA batteries and stores the results of up to 100 inspections in its internal memory. Woolstenholmes said that as well as identifying faulty steam traps, the PT1 Pocket Trapman has helped Sunlight to reduce energy consumption at each facility.